Is my daughter throwing fast enough? I hear that question asked all the time. Coaches, parents, even pitchers ask am I pitching fast enough, or what is the average softball pitching speed for my age, or am I in the ideal pitching speed range for my age… am I throwing hard enough? For me, someone who promotes spin before speed it may surprise you that I’d even have this content on my website, but one caveat of the ‘pitching speed question’ is that there is a minimum speed limit that will happen by age when mechanics are sound, when mechanics are being performed optimally. Therefore I have created the chart on this page (below) to be a helpful guide or an indicator of solid, safe mechanics mostly. From my experience giving pitching lessons to girls from 8 – 23 years old, if your mechanics are efficient and correct you will ultimately fall into the range of pitching speed averages listed below. I do also base somewhat whether or not to teach a girl a new pitch on if she’s at these base-level speeds, for example I won’t teach a change-up until a girl is throwing at least 40 MPH, and I won’t help a female athlete develop a riseball until she’s throwing in the mid-50s (because based on physics and the throwing distance of 43 feet that’s the optimal combination to make a tight late-break, spiny riseball hop 2 – 4 inches, which is practically unhittable! Keep in mind that the averages I’ve listed are not concrete, they’re not set in stone. They are just a guide to use mostly to see if your daughter, at her specific age is leaving any speed ‘on the table’. In other words, if she is 3 MPH below the averages in the chart, but then tweaked her mechanics to make them more sound and efficient would she quickly gain those 3 MPH on her fastball? In most cases the answer is yes. Most noticeable pitching speed increases come when girls start to use their legs, but I’ve also seen opportunity areas in girls ‘slamming the door’ closed harder, and/or developing a better wrist snap or ‘wet noodle’ arm whip. Arm speed helps, but on the other hand I’ve also seen girls that are 16 years old top out at 50 MPH, have been throwing that fast for 2 – 3 years but they can’t seem to get any more speed. Since generally arm speed can only generate that much speed at its maximum, usually girls are not utilizing their legs enough in this situation. I’ve had pitchers jump from low-50s to high-50 MPH at age 14, 15, & 16 years old just by tweaking mechanics, or utilizing them better anyway. The speed is there, but they’re just not using it. Otherwise, girls typically will be able to add 1 – 2 MPH per year naturally when built on top of a sound mechanical foundation. How do I throw faster? Well… balanced strength training and structured weekly pitching reps will help accelerate speed increases organically. I have speed drills that I use to teach girls to use their legs better and to synchronize their lower half of their body with their upper half, like the walk-through drill. The following 3-step walk-through drill video wonderfully demonstrated by Amanda Scarborough is recommended to add to your daily pitching warmups to help increase speed by utilizing leg drive and speeding up the arm circle. Softball pitching drill to help increase speed! Is my kid throwing hard enough? If you are in within the following pitching ranges for your age and your mechanics are solid and efficient (and your not in the averages simply because your abnormally strong or tall for your age), then more speed will come over time naturally. The more you pitch, naturally the body’s going to become more fluid and stronger and speeds will organically increase to where many girls can throw 60 MPH by the time they’re in their late years of high school or early years of college. Side note on college recruitment’s affects on the speed pursuit: The nice thing in 2018 about the NCAA now not allowing D1’s to recruit girls until 11th grade is that we don’t have 8th graders just throwing as hard as they can to get a look by a Division I coach, using bad mechanics whereas by the time they’re in 11th or 12th grade are having back, shoulder, and elbow injury problems… unfortunately then, not able to pitch in college much because they’re frequently injured and hurting. ~Notice that the averages are very broad in the 12, 13, and 14 year-old ranges due to the fact that these ages still encompass a good bit of entry-level girls along with the ones that have been pitching for 3, 5, or even 6 years already. Young pitchers that are new and just learning usually start out throwing at about 35 MPH. ~Increases in fastpitch softball pitching speeds due to proper mechanics and better instruction is happening as National Pro Fastpitch (NPF) and college softball proliferates, therefor we’re seeing higher speeds all the more often, across the country. ~Keep in mind that a 74 MPH pitch at 43 feet is well over the equivalent of a 100 MPH baseball pitch that’s thrown from 60 feet away. Radar guns are not perfect, especially the cheaper ones! Some can vary at least 2 – 3 MPH from gun to gun, so don’t be a stickler on your daughter against the number that gets shown. Use radar guns mostly as a relative indicator, especially when looking for the differential speed between the fastball and the change-up, which I like to keep at about 15 – 20%, by the way. Also keep in mind that the speed of a pitch and how it relates to a game as opposed to a practice or when the radar gun apparently comes out (because girls tend to stiffen up and tighten the muscles when seeing radar guns, so the readings aren’t generally as true as everyone would like think) can vary greatly. 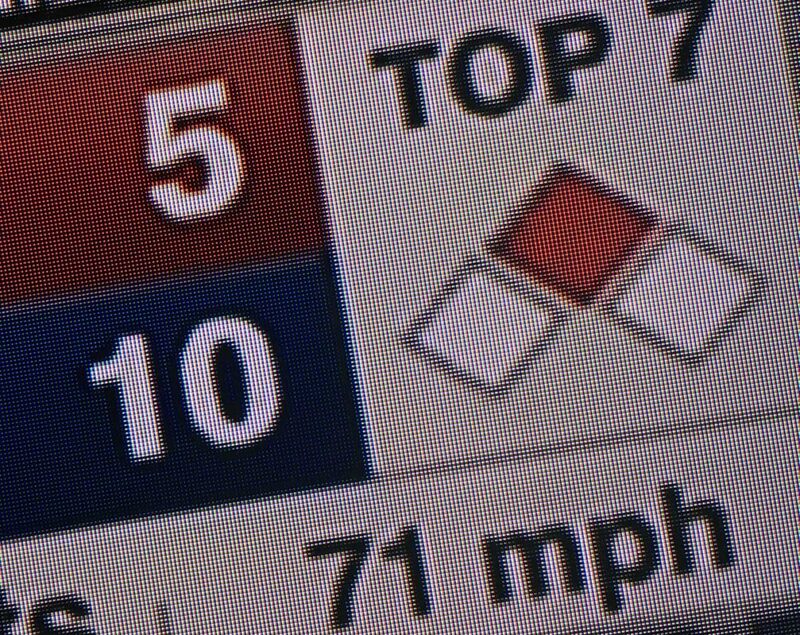 If a girl claims to throw 60 MPH at 12 years old by radar, then I’d be interested in seeing this consistently happen during a game. Again, I’ll switch back to a spin-before-speed focus because in a game, obvious results will seen if a girl is throwing a shutout, while working ahead, spinning the ball, and throwing a 70% strike/ball ratio. Speed is a less important than spin, which will dominate at any age. Can softball pitching speeds be too fast? Believe it or not yes. For the distance of 43ft doesn’t change and as speeds increase up through 70+ it leaves much less room for late-breaking spin to have room to work and break, so pitching becomes less effective as the spin-to-speed ratio decreases, and hitters simply start to better be able to time the pitch. This is probably a reason why Cat Osterman still holds the strikeout record in the NPF with 234 K’s (in 2013) and Monica Abbott does not, but throws as one of the hardest at top speeds of 74 MPH. Is my daughter throwing below average for 12 years old if her pitching speed is below 40 MPH? Yes, there is likely a mechanical opportunity area that needs to be addressed. What’s the average pitching speed for a 14-year-old girl in fastpitch softball? The average speed at this age is 46 – 54 MPH. In high school how fast should girls be throwing to be the most competitive? Typically girls will be successful throwing 50+ in high school (depending on school size and how many ‘travel’ girls are playing on the school’s team), and having highest success while throwing in the upper 55 – 65 MPH range. How can I help my daughter throw a softball faster and harder? Correct her mechanics to be as safe and efficient as possible, very linear … and then have her throw that way more and more, usually 3-4 times a week 80-100 pitches a session at high school age. Should my daughter throw a weighted ball to increase strength and arm speed? NEVER use a weighted ball for anything other than flicks! Even 10% more weight exponentially increases torsion on the female shoulder. The payoff of weighted balls are temporary and not worth the danger! The risks are not worth the rewards folks… NOT recommended! How can I improve a pitcher’s delivery speed in fastpitch softball? Girls need to use their legs or their not maximizing their speed potential. Isometric core strength training workouts always help with speed and physical balance too. What are good softball pitching drills for speed? Drills like the 1-arm, 2-circle drill while on a knee help with true arm-speed, and use walk-through drills to correct timing and synergize the upper and lower halves of the body, which can do wonders! What is an average pitching speed in competitive college conferences, by Division?